Solar Portrait in Love. Finalist, People. Faustina Flores Carranza (66), and her husband, Juan Astudillo Jesus (63), sit in their solar-lit home in San Luis Acatlán, Guerrero, Mexico. Faustina and Juan have seven children and have been together for 48 years. Like many members of the Mixteca indigenous community, they have never had access to electricity. Image Credit: Photograph by Ruben Escudero. All rights reserved. The Xoloitzcuintli, relative of an ancient Aztec dog. Image Credit: Photograph by Yann Arthus-Bertrand/Corbis. Mexico’s main national animal is the golden eagle—the bird that legend says played a role in the founding of Mexico City and appears on the country’s flag. But the country didn’t stop there: it also selected a national mammal (jaguar), a national arthropod (grasshopper), a national marine mammal (vaquita) and a national dog, (xoloitzcuintli). 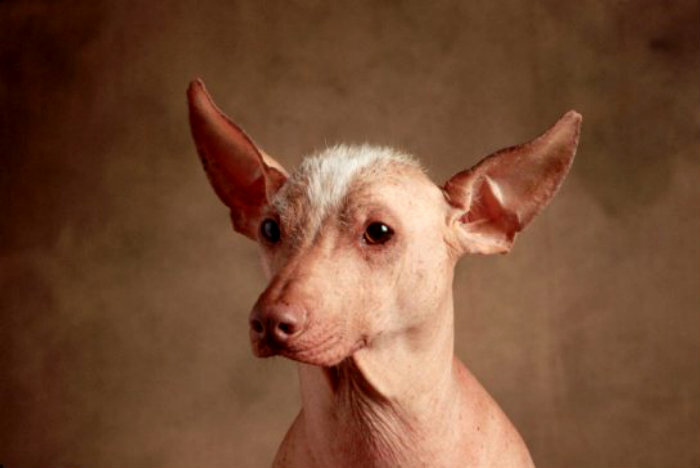 Commonly called a Mexican hairless, the xoloitzcuintli (pronounced “show-low-itz-quint-lee”) descends from an ancient species native to Central America that was prized by the Aztecs, who believed the canine to have healing abilities. via Ten Unusual National Animals That Rival the Unicorn | Science | Smithsonian. 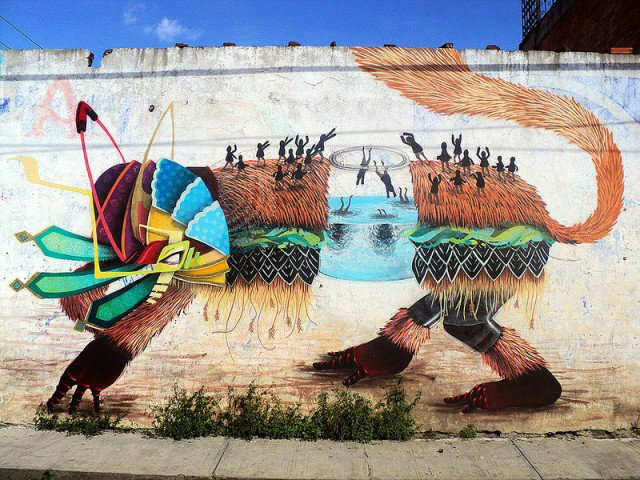 Mythical Mural Art by Curiot. 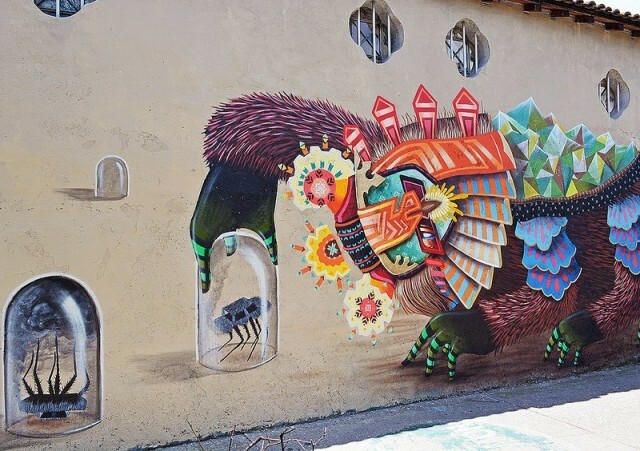 Mexican street artist Favio Martinez, better known as Curiot, is famous for his mixing of humans and animals in his works, creating some new forms of living beings. 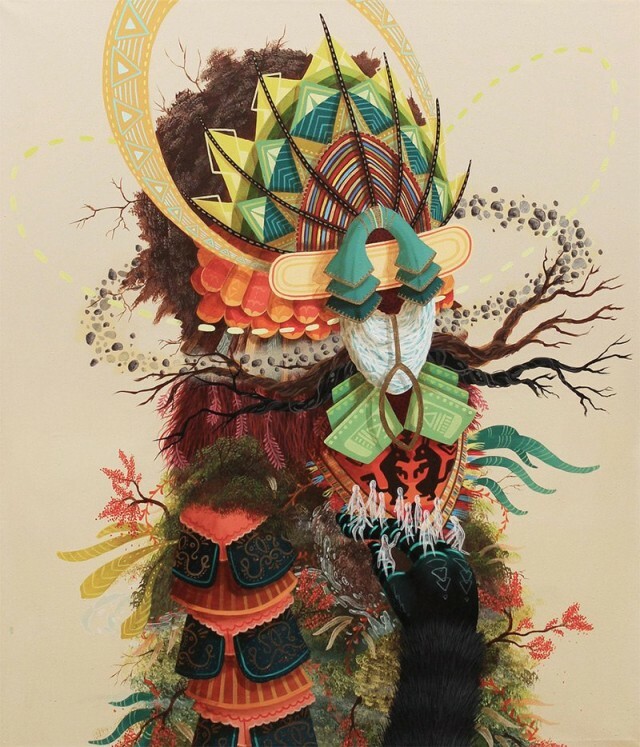 In his illustrations there are present many folklore elements of the Mexican people, which have roots in Native American folklore. Favio Marinex was born and raised in the United States, but ten years ago, returned to his ethnic homeland. He lives and works in Mexico City now. via Mythical Street Art by Curiot | Weezbo Inspiration. 1st New World Medical Book published Mexico City, 1570. Just over thirty years after the first printing press arrived in the New World from Spain, the first medical book was printed in Mexico City: Francisco Bravo’s Opera Medicinalia, published by Pedro Ocharte in 1570. While it is well within NLM’s mission to collect, preserve and give the world access to such a book, there is only one known copy of it, housed in La Biblioteca José María Lafragua at the Benemérita Universidad Autónoma de Puebla in Mexico and we are all extremely fortunate that this sole copy has been digitized by the Primeros Libros project. The National Library of Medicine does have a copy of the text, however, in the form of a photostatic copy made in 1944. Long before the age of digitization, the only ways to make rare texts available at other libraries were by copying them by hand, reprinting them, microfilming, or making photocopies, all of which are extremely time-consuming and expensive for entire books. This copy was made from a photostatic copy at the Huntington Library, Art Collections, and Botanical Gardens, which in turn was made from a photostatic copy at the New York Public Library. The copy in New York is described as a “facsimile reproduction of the original at the Library at the Universidad de Puebla, Mexico” where the only original copy is held. via The First Medical Book Printed in the New World | Circulating Now. Isaac Cordal’s Mini Cement Skeletons. Artist Isaac Cordal (previously) is well-known for his creation and placement of miniature cement figures in public places around the world as part of an ongoing series called Cement Eclipses. While the meaning behind each tiny sculpture is intentionally ambiguous, it’s impossible to look at each piece without imagining a story. Isaac Cordal is sympathetic toward his little people and you can empathize with their situations, their leisure time, their waiting for buses and even their more tragic moments such as accidental death, suicide or family funerals. The sculptures can be found in gutters, on top of buildings, on top of bus shelters; in many unusual and unlikely places. These new skeletal works are part of a 2013 series he created in Chiapas, Mexico, and he also had work this summer at ArtScape 2014 in Sweden. 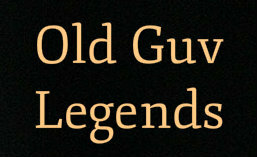 You can see more over on Facebook. (via Supersonic). See more Images via Artist Isaac Cordal Leaves Miniature Cement Skeletons on the Streets of Mexico | Colossal. If you wanted to see a wild axolotl, you may be out of luck. The happy-faced amphibian has long been in a tough spot, because its only native habitat is the muddy network of lakes and canals around Mexico City, which has been threatened by pollution, urban sprawl and competition from invasive species. 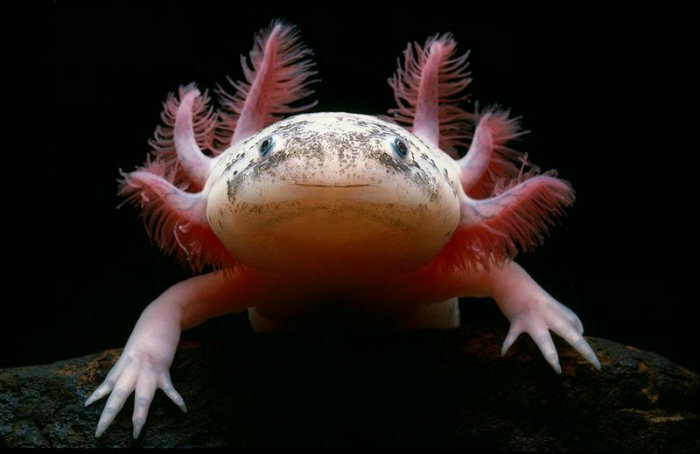 The animals’ numbers had been declining for years, and in January, Mexican researchers told the Guardian newspaper that after four months of searching, they could find no axolotls in the wild. The searches will be repeated before the species is declared extinct in the wild—but from now on, you may not be able to smile back at an axolotl unless you find it in a fish tank or aquarium. via Ten Cool Science Stories You May Have Missed in 2014 | Science | Smithsonian.